Home » Horse Shows » Petition regarding showing in the road horse division at various horse shows. Petition regarding showing in the road horse division at various horse shows. 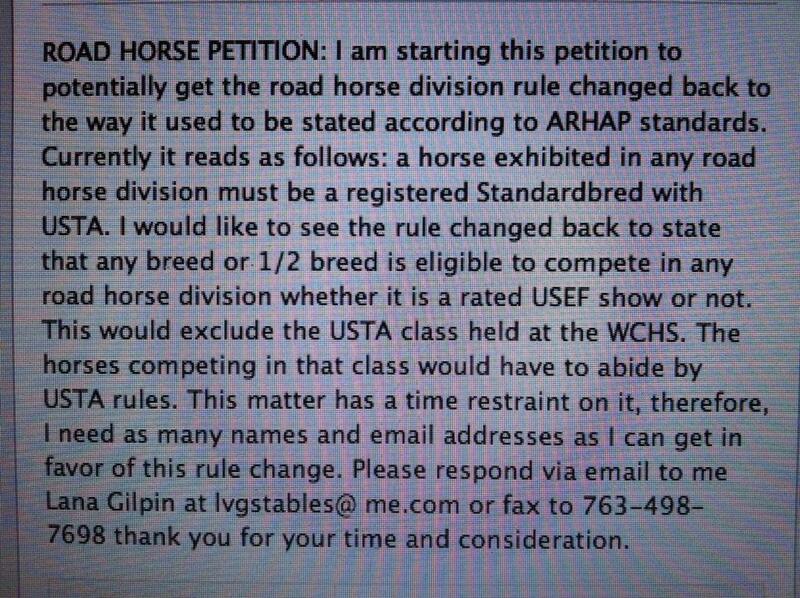 Lana Gilpin at lvgstables@me.com is circulating a petition regarding showing road horses. The petition is copied below, under our conversation. I wrote to her because we are unable to show our wonderful morgan mare, Sleipnir Onstar, at shows like the Dixie Cup, which has dedicated classes for Saddlebreds, Morgans, and Hackneys. There are no Standardbreds shown there. Even if there were, we were looking for a Morgans only class. Under previous rules, this would not have been a problem. Under the current changed rules, it was not possible to show her there. Thank you for taking the time to read this; and your support. … Correct me if I am wrong. We could not even have a Morgan roadster to bike class included in the show…not allowed by the current rules. All classes were breed specific…so, not like they were competing in an open show. The way I read your petition, it would address this issue. If I am correct, we support the petition, so will our trainer and friends. Yes Georgia this would address your issue as well. Thank you for your support. And I’ll send it on to our trainer who predominantly does hackneys. Please contact Lana to be included on the petition. Or if you have any questions. This entry was posted in Horse Shows, Morgan Horse, multidiscipline talents and training, National caliber morgan show horses, Road Horses and classes, Roadster to Bike and tagged Morgan Horses, national caliber, Show Horses. Bookmark the permalink.